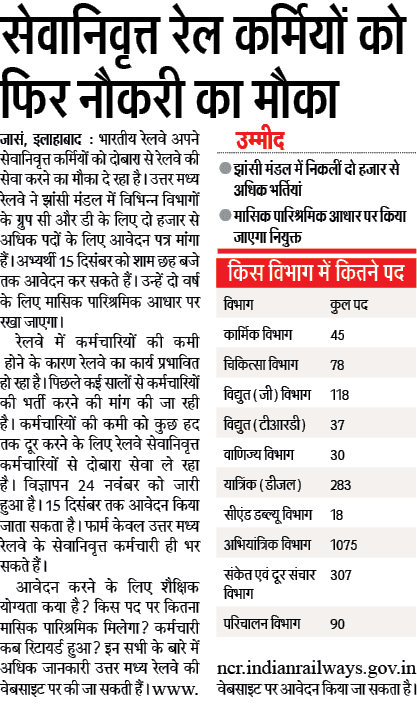 NCR Vacancy 2018 Application are invited to fill 2351 vacancy in Jhansi, Allahabad & Gorakhpur Division. Only Ex service men person is allowed to fill 2 years Samvida Vacancy in UP Medical Department, IF Dept, Assistant Engineer, Mechanical (Diesel) and various department of North Central. North Central Railway said to all Indian Citizen who ex servicemen in related posts. Age Limit: No Matter age and Qualification is required.